Digital Impressions VS. Traditional Impressions- The next BIG step in Dentistry! 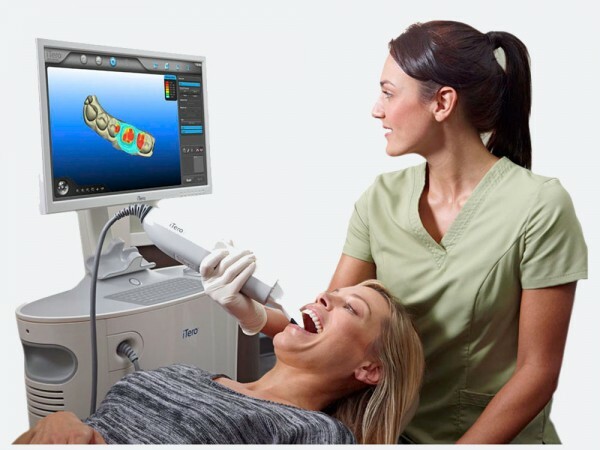 Recently at Philadelphia Dentistry we began using an iTero digital scanner that allows us to do impressions for our patients without impression material and trays. It has been great for our staff and also for our patients as there are many advantages to digital impressions over traditional impressions. An important advantage to note is the efficiency of workflow. The production is streamlined from the laboratory back to us because the digital scan is sent immediately to the laboratory and they are able to review the case within 24-48 hours. What this translates to for patients is less time in their temporary acrylic crowns which is great for the patients. An additional benefit dentistry gains from digital impressions is the fact that they can be repaired. This is not the case for traditional impressions. With a traditional impression if there is ever an air bubble or a distortion in it, the patient must go through another impression again. For a digital impression, the dentist and assistant are able to easily pinpoint the area that needs redone, scan that specific spot again, and the scanning software is able to stitch it together with the previously captured data. When a digital scan is sent to the lab it also allows the dentist and the lab technician to communicate directly with each other about the case. If there are any issues then they can be handled immediately and patients do not have to wait. Another great thing about digital impressions is the ability to show fine details that the naked eye can miss. This precise level of accuracy will aid in the dentist’s work and create a better product for the patient. Finally, perhaps the BEST part about taking digital impressions, is how much easier it is for patients! No more gagging, strange tastes, or messy faces full of impression material. Call us at 215.568.6222 to schedule a free consultation with Dr. Ken Cirka and Dr. Jessica Meier. They can talk to you more about your dental health in addition to digital impressions. We look forward to meeting you soon! Exercising has numerous positive impacts on your health. It helps with stress relief, muscle strength, combating health conditions, and loads more. What many patients do not know is how exercising can affect their dental health. Believe it or not, exercising can cause problems with your teeth that you may not be aware of. During intense exercise people will often be breathing through their mouths. When people are mouth breathing, it will dry out the mouth and reduce the flow of saliva. A dry mouth is an environment where bacteria will increase and grow. People that suffer from dry mouth are very much at risk for cavities and so heavy exercise can put you more at risk for tooth decay if you are breathing through your mouth. Additionally, when people are exercising heavily they often are drinking sports drinks. Many sports drinks can erode the teeth and cause major damage. If you are not careful, your mouth may need a makeover. They will erode the teeth not only if there is sugar in them but also because they are very acidic. Anytime the mouth is an acidic environment it creates a breeding ground for the bacteria that cause cavities. What’s more is that while working out, most people tend to take sips throughout the workout. This is constantly bathing the teeth in sugars and acids, which will make the teeth more vulnerable to decay. If you are going to enjoy a sports drink it is much better if you drink it and be done with it, do not continuously take small sips. After you finish the sports drink, be sure to drink some water to neutralize the acidity level in the saliva to protect your teeth from cavities and other damage. While the above details negative impacts on your teeth that can happen while exercising, keep in mind there are significant health benefits to your teeth and your entire body from the action of exercising. A study in the Journal of Dentistry found that exercising regularly can actually lower the risk of gum disease for people. Also by having a healthy body mass index (BMI), the mouth is a lot healthier. This is because the higher the BMI, the more likely you are to have hypertension and diabetes which both are known to put you at risk for poor oral health. While exercising, be sure that you are drinking water in addition to any sports drinks. Another alternative to water and sports drinks is coconut water. 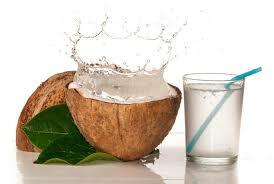 Coconut water has anti-inflammatory properties and also helps to balance insulin and glucose in the blood stream. By being aware of how your dental health is affected by exercise, you can avoid risk factors and keep your mouth happy as well as your body. By keeping up with a regular dental routine you will be able to stay on track with your oral health. This means brushing twice a day, flossing once a day, and seeing your dentist regularly for check-ups and cleanings. Call us today to schedule your free consultation with Dr. Ken Cirka and Dr. Jessica Meier at 215.568.6222. We look forward to meeting you soon! Should you kiss your pets? Whose mouth is cleaner? There are a lot of people that believe their dog and cats mouths are cleaner than their own. There are other people that believe the saliva from a dog is actually a disinfectant and can help kill bacteria. Finally, there are those that are totally grossed out by kissing their pets and are worried that it could in fact make them sick. Looking into this deeper, there are a couple of things to keep in mind that are detailed below. There are a lot of bacteria in both the mouths of humans and in animals. Keep in mind that not all of it is harmful. It is very rare for the bacteria in a pet’s mouth to make a human sick. The bacteria that is harmful that can pass from the dogs or cats mouths to ours are parasites such as roundworm, hookworm, and giardia. If you are taking your dog to the vet regularly for check-ups and your pet does not have any symptoms of sickness, then your dog likely does not have a parasite such as these. As for viruses, these are u sually specific to a certain species. This means that a virus does not pass from a human to an animal and vice versa. So do not worry if you have the flu or the common cold, you will not pass it to your dog or cat. Humans that are immunocompromised, however, should avoid kissing their pets. If your immune system is already lower than average, if there does happen to be harmful bacteria in the animal’s saliva, you will not be able to fight it as well as a healthy person. What you do want to keep in mind before kissing your dog or cat is what they may or may not have been doing earlier in the day. Dogs and cats tend to eat dirt, grass, and all kinds of things that people tend to stay away from. Any of the bacteria or particles that they may have been near or consumed earlier is absolutely a risk that can be transferred to people and should be kept in mind. So far there is no compelling research showing that the pet’s saliva is a disinfectant; however, there is not definitive research proving that it is harmful either. Make sure that you know what they were up to earlier in the day and the main thing to keep in mind about kissing your pets is that you are doing it at your own risk. 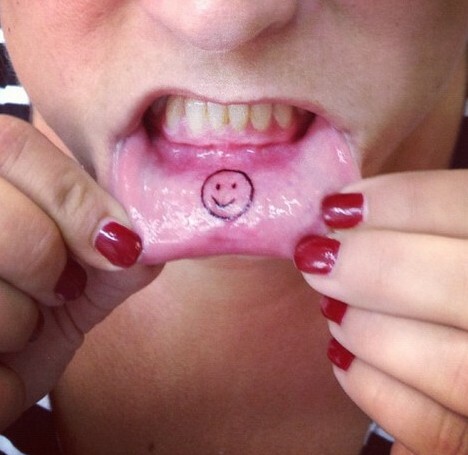 Piercings and Tattoos in Your Mouth- What Are the Risks? Patients will often ask about piercings and tattoos in the mouth and how it could affect their teeth. In addition to affecting your teeth, there are a lot of potential issues that could pop up from oral piercings and tattoos that affect your overall health, not only in the mouth. Harm to the teeth, fillings, and gums- Patients that have oral piercings often report to me that they have a habit of clicking their piercing against the teeth. This habit will not only damage the teeth, but it causes the gum tissue to become irritated and receded as well as fillings to become damaged. Sometimes I see evidence of this habit and patients are unaware that they are doing it. This leads me to believe that the habit is happening while the patient is asleep, which can be very dangerous and a choking hazard. Infection- The mouth and tongue contain millions of bacteria. These bacteria can quickly adhere to areas around the piercings or the tattoos and cause an infection. Since the mouth is a warm, moist environment, infections can travel very quickly there. Any infection that causes swelling in the mouth, especially on the tongue, can quickly become life-threatening by closing the airway. Damage to nerves- When piercings and lip tattoos are done, there is always a risk that damage can happen to the nerves in your mouth. Nerve damage is usually reversible; however, sometimes the feeling in your mouth never quite reaches what it originally was. Keep in mind that the tissue lining of the mouth is more delicate than the inside of the eyelid so there is a potential for damage. Be sure to keep the piercing and the area very clean. Ask your dentist and dental hygienist for tips on this. Do not tap and click the piercing against your teeth. Also by being aware while you are chewing and talking you can try and avoid problems since each time we talk and chew our tongue touches the teeth and the piercing could cause damage. Check the fit of the piercing time to time with sanitized hands. This can help avoid the jewelry from getting loose or becoming a choking hazard. Take the piercing out before engaging in sports activities to avoid any issues and protect the rest of your teeth with a mouth guard. If you start to any signs of infection such as pain, fever, chills, swelling, or a red-streaked appearance around the site of the piercing or tattoo, be sure to contact your dentist immediately. Any oral piercing or tattoo is an added responsibility that requires maintenance and upkeep. Be sure to talk to your dentist and dental hygienist so that you are aware of how to properly clean the area to minimize your risk of infection. Call us at 215.568.6222 to schedule your free consultation with Dr. Ken Cirka and Dr. Jessica Meier. We look forward to meeting you! Dental implants are an incredibly strong, stable, and long-lasting solution to replace missing teeth. The implants are “man-made” roots composed of primarily titanium, a biocompatible metal that fuses to your jaw bone. The implants do not become loose like dentures can. 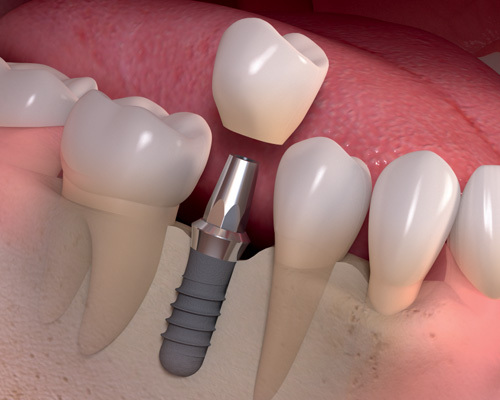 Implants can be used to replace a single tooth or many missing teeth. Depending on your situation the implant specialist and the dentist will work together to find the best solution for you. The health of the gums and bone are important considerations when determining if you are a candidate for dental implants. If the bone is not strong enough to support the implant, the implant specialist will need to do a bone graft to make the bone stronger. For the upper teeth the implant specialist will need to evaluate your sinus. A sinus lift may be required in order to create enough space for the implant in the bone. Most dental implants are extremely successful with proper planning and teamwork. 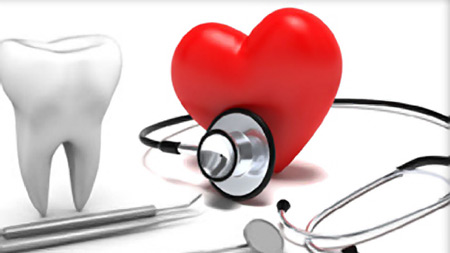 An important factor in implant planning to consider is the general health of the patient. If a patient is a heavy smoker, has a history of osteoporosis or a health problem that compromises the immune system, then implants may not be a good solution. To find out if you are the right candidate for dental implants, talk with your general dentist. He or she will be able to steer you in the right direction. Exercise good oral hygiene– brushing your teeth two times a day and flossing one time each day is important. Other tools include using proxy brushes that slide in between the teeth can help to clean the hard to reach areas around your teeth and implants. Stop smoking – this is a key factor in implant failure. When you smoke you are weakening the jaw bone and this can cause the implant to fail. 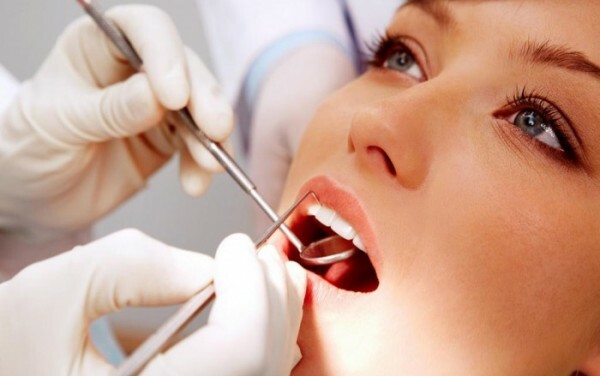 See your dentist regularly for checkups– it is important to see your dentist and dental hygienist for checkups an d cleanings minimally every six months. This ensures you will keep your teeth, gums, and implants in good condition and they can give you tips to keep it this way. Avoid bad oral habits – habits like nail biting and chewing on ice cubes are not good for your teeth or implants. These habits can break the implant crown and even your natural teeth. If you are interested in learning more about if dental implants are the right solution for you give us a call at 215.568.6222 so we can schedule your free consultation with Dr. Cirka and Dr. Meier today. We look forward to meeting you! Straightening the teeth has a lot of benefits besides cosmetics. The straighter the teeth are, the healthier the mouth is. This is true for young patients as well as adults. In the past, traditional metal bracket braces were needed to straighten teeth. 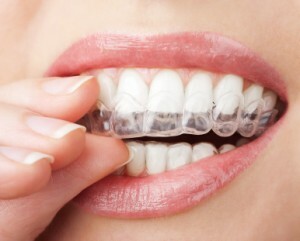 Now dentists are very successful in treating patients with clear aligner therapy to correct malocclusion (a bad bite). A big secret to how to look younger is in your teeth. Looking beautiful is often associated with looking younger and the teeth play a big part in this. Studies show that a smile is the first thing people notice about you. Working with your dentist to either preserve your natural teeth or enhance them is a great place to start in looking younger and being healthier. Bad breath, Halitosis, is a very common problem that can occur at any age. Often it can be difficult to tell whether or not this is a problem for you.